Electric cars may be growing in popularity, but they still make up just a tiny percentage of the U.S. auto market. When will things take off? If sales in Norway are any indication, that will happen when electric vehicles become inexpensive, easy to own, and confer certain privileges. According to Treehugger, Norwegians are crazy about electric cars. Despite a population of around 5 million -- roughly the size of metropolitan Miami, Florida -- Norway is home to more Nissan Leafs and more Tesla Model S reservations than the entire U.S. In fact, electric car sales made up 5.2% of the Norwegian auto market in 2012, while here in America, the figure sat below 1%. 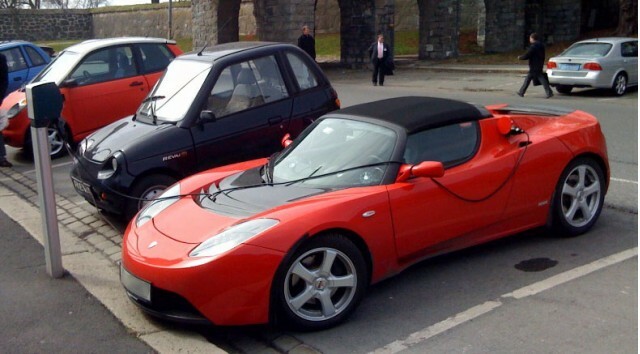 Convenience plays a big part in Norway's fascination with electric cars. While range-anxiety remains an issue, Norway offers around 3,500 charging posts for electric cars and 100 fast-charging stations. Also, electric cars often have access to free public parking, and they don't have to pay congestion fees when traveling through busy parts of town. And in the capitol of Oslo, electric car-owners are allowed to drive in the bus lane. Ownership has its privileges. Then there's the fact that electric cars like the Nissan Leaf are relatively cheap in Norway. Throughout much of Europe, buying a car can be an expensive proposition, due to hefty taxes. But in Norway, electric vehicle-buyers get a break. True, they still pay some taxes on their new cars, but there's no import tax on the Leaf as there is on other Nissans. This makes the Leaf far, far more competitive in the country's auto market -- in fact, it's the 13th most popular vehicle in the country. Now, other countries like Sweden are looking at the Norwegian model to see if they can emulate it. The question is: could perks like these spur electric-car sales in the U.S.?